Mila’s gown sparkled in effervescent gold as she entered the ballroom that was hosting the midnight gala. She held a glass of champagne in her hand as if she were royalty. From somewhere to her left, a flautist and guitarist were playing Schubert’s Ständchen. It was one of her favorites so he must have arranged it. She watched Marcelo descend the stairway and then stop at the bottom, his eyes were enchanting like the invitation for a kiss. Mila finished her wine and nonchalantly placed it on the tray of a passing server. She approached him as one approaches a dream or fantasy. She took his arm and he guided her way through the crowd and out of the main doors of the Hilton San Diego Bayfront. A valet was just stepping out of the driver’s side of an ebony Ferrari LaFerrari Aperta with crimson trim. Marcelo reached inside his tuxedo jacket and extracting his wallet, tipped the young man more than he could hope to earn in three months. Ignoring the grateful valet, Marcelo opened the passenger door for Mila and once she had secured herself, he got in behind the wheel and slowly drove away. 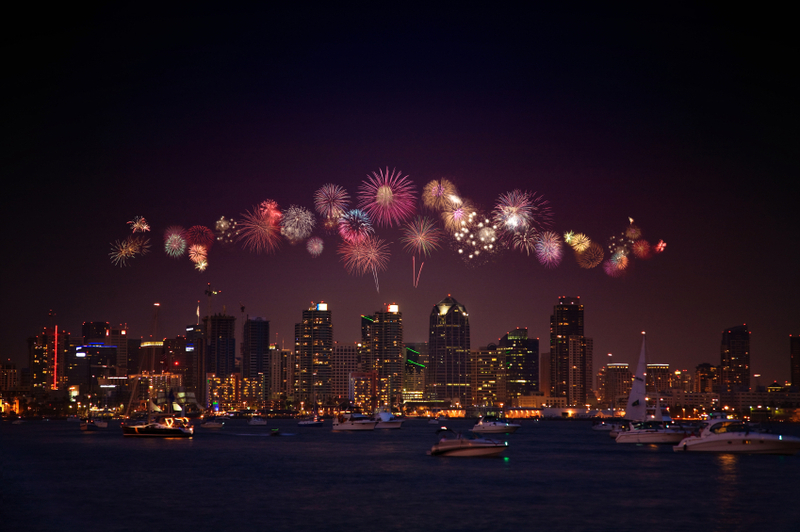 In the first minutes of the New Year, they were racing north on Interstate 5 near La Jolla, a gigantic celebratory fireworks display illuminating the sky behind them, when a brilliant and devastating explosion reduced the Bayfront Hilton to flaming, iridescent rubble and debris. Nearly six-hundred people were killed in just a few moments. Marcelo and Mila would watch the golden spectacle he had created later on the news. This was the first of their astounding mass murders but certainly not their last. I wrote this for the Mindlovemisery’s Menagerie “Bonus” Wordle for “New Years”. The idea is to use at least ten of the twelve words posted, or some variation of them, in the body of a poem or story. I used eleven only omitting Chanel No. 5. Click the link above to find the full list and to see if anyone else responded to the prompt. A few things. I did a Google search for “Largest New Years Gala” and quite a few came up in the results. I picked San Diego because it was high on the list and for no other reason. I chose a flautist and guitarist duet because that was who provided the music for my wife’s and my wedding over thirty years ago and I found it quite beautiful. I don’t remember what specific pieces they played and selected Schubert’s Ständchen because it’s what came up in another Google search. Marcelo must be exceptionally wealthy because his Ferrari LaFerrari Aperta costs $2.2 million. I thought I’d give him an extravagant getaway car. Yes, I suppose I could have written a more optimistic “Happy New Year” story, but I’m sure just about everyone else will be or has already done that, so I chose a more sinister theme. At least it’s not vampires this time. Happy New Year. No, seriously. I mean it this time.